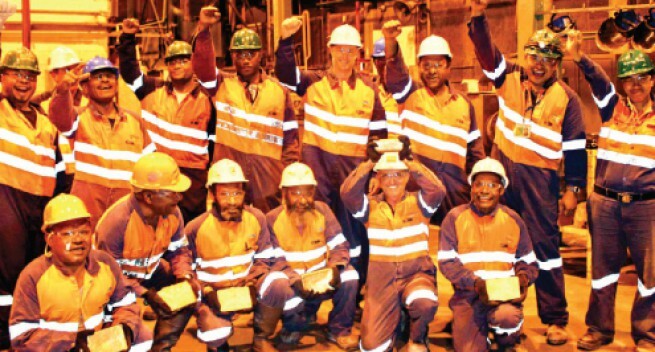 THE Porgera gold mine in Enga Province reached a milestone this month achieving 20 million ounces (oz.) in gold production since the start of operations in 1990. The mine is a joint venture operation between Barrick Gold Corporation, Zijin Mining Group and Mineral Resources Enga (MRE) Limited. In a statement the firm released yesterday it announced that the PJV processing department had attained the +20 million oz on March 6, 2017 after 7044 ounces were produced that day. Marking its significance for the 26 year mine operation, six of PJVs longest serving employees and some production and processing staff were invited by the PJV management to witness the historic gold pour event. PJV general manager operations, Damian Shaw on behalf of the management, commended the efforts of those who had been involved with the operation since the first pour in 1990 and those who were still with the operation working safely, 20 million ounces later. "This has been a great effort by everyone, the employees, the community, the government and all other stakeholders. To those who work behind the scene to make it possible to achieve this result, congratulations. "Not many mines meet 20 million ounces, it is a rare achievement. Porgera still has a long life so let’s get another 20 million," MrShaw said. The +20 million oz. is derived from more than 143 million tonnes of ore that have been mined in both the Open Pit and Underground since start of production. Production superintendent (Anawe) Anthon Pakyo, acknowledged the contributions from all of the PJV site departments, adding that there have been challenges along the way but as a team, the site has achieved this. "For the processing team, this is a real milestone achievement as we all know it has been challenging to get this far. We can hope for some more million ounces in the future through our continued team efforts," Mr Pakyo said. Porgera accounts for, on average 11 per cent of Papua New Guinea’s total exports and is a major contributor to the PNG economy in taxes, duties, royalties and infrastructure development. PJV has also managed over 570 tax credit scheme (TCS) and infrastructure development program (IDP) funded projects valued at over US$74million since the start of TCS in 1992.